Hello there, remember me? :) Sadly I couldn't properly take part in this month's Clearly Besotted Teasers, as I am still not feeling my best. I did start making a card before I went in for my procedure though, and yesterday I managed to stick it all together. I hate missing out on a CB release, so I am really happy to be popping in, even if it is at the last minute! The whole release is amazing (as always!) but the set that called my name first, was the Petite Baby Shower set. How adorable is this elephant? I started off by taking a panel of white cardstock and stamping the elephant repeatedly across it (to look like a family of elephants holding tails). I then coloured these in rainbow colours using Copic Markers. I took another panel of white cardstock and ran this through my Cuttlebug using the PTI Sunrise Impressions 2 Embossing Plate. I then stamped the sentiment from the CB set on top. The panel was cut down and adhered to an A2 SSS Audrey Blue card base with ATG. I then added the elephant panel on top with foam tape. COPIC MARKERS: Pink - R81, R83, R85. Orange - YR12, YR15, YR16. Yellow - YR13, YR15, YR17. Aqua - BG11, BG13, BG15. Blue - B12, B14, B16. The new products from Clearly Besotted release tonight at 10pm BST. You can purchase them from the Clearly Besotted shop (UK based, ships worldwide), Simon Says Stamp (US based, ships worldwide) and Ellen Hutson (US based, ships worldwide). Sadly I don't have a release video this month but please pop over to see Stephanie for the reveal of the sets. 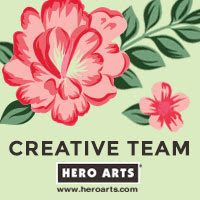 She will also have links to my design teamies sharing today. Thanks so much for visiting me today and a huge thank you to everyone that has left me such kind messages during my absence, they really mean the world to me. Hopefully see you soon! Another cracking card, Michelle! I hope you're well on the road to recovery. Love your adorable card! Michelle, so glad to "see" you back again and hope your health improves each day until you feel like yourself again. I am sorry to hear that your recovery takes a while. I've missed you in blogland, but please, take your time. 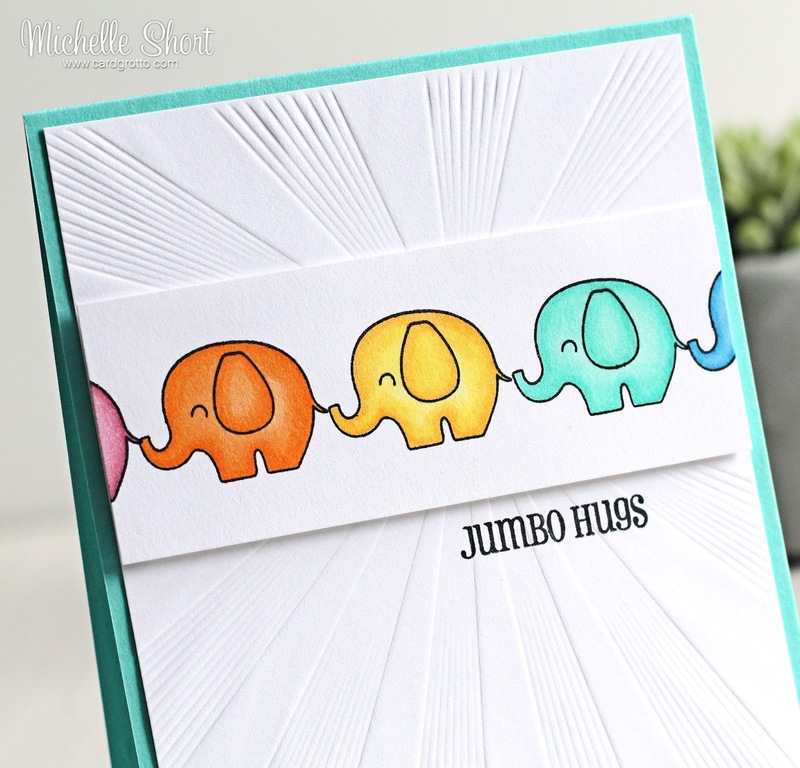 Really, your card with these little sweet elephants is a beauty! I love your style (have I ever mentioned?? LOL). Have a nice day, and thank you for popping in. It's lovely to see you back, Michelle, I've been thinking of you! Hope you're feeling better soon. The card is gorgeous, I love the background! Yaaaay you're back!! :D Hope that means you are on the mend my lovely!! Gorgeous card Michelle and your wee elephants are just too cute!! 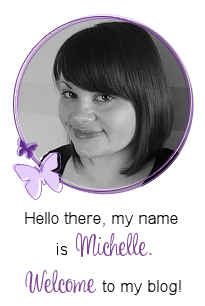 Hi Michelle, so happy to see you here have missed your teasers this month. Great card, love embossed background and your parade of colourful ellies are perfect. Lovely card Michelle, wonderful use of colour and texture. Hope you are feeling back to your best soon I miss your cards and videos! Michelle, I want you to know that you are always in my thoughts and prayers. You know I also suffer from chronic illness, so I can understand some of what you are going through. Please always feel free to contact me if you need a shoulder to cry on or an ear to listen. I am praying that you will be feeling much better soon, know you are loved and prayed for! this is so totally adorable!!! !